Eric is now on Facebook. There is wisdom here in Eric Torgersen’s poems, wisdom and also humor (the poems make us feel that it is impossible to have one without the other.) Irony and tenderness—along with wisdom and humor—also move playfully in each other’s company. And all these qualities are brought together under the aegis of a form as challenging to write as it is enticing to read. What joy these poems give and what a pleasure they offer to anyone lucky enough to be drawn into their orbit. – Jim Moore – Author of Invisible Strings and Underground: New & Selected Poems. The house, you’ll notice, is on fire again. We might decide to put out the flame for a change. Look back. Look down. We’re all alone up here. Let’s not forget the way we came for a change. ​you realize this is a book anyone can read with pleasure and instantaneous understanding, even those determined not to understand. – Christopher Howell – Author of The Crime of Luck and many others. I was just an average Joe back then. I had no plans or dough back then. I was feeling pretty low back then. I started hanging out too much. I had no place to go back then. you just went with the flow back then. you didn’t really know back then. but I started getting into stuff. I never could say no back then. you did a lot for show back then. I lost it in the snow back then. I did it. Long ago. Back then. From In Which We See Our Selves. First appeared in 32 Poems. ​Click What's New for a list of recent, current and forthcoming publications. "I Will Die in Lake Superior" appears in And Here: 100 Years of Upper Peninsula Writing, 1917-2017, ed. Ron Riekki, Michigan State University Press, 2017. Eric's essay "Gaga's Left Arm" appears in Serving House Journal 15, Fall 2016. 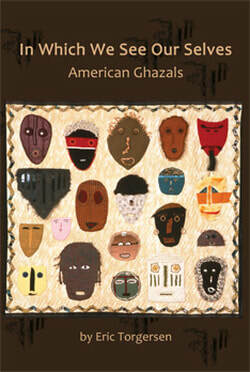 Eric's essay "Writing the American Ghazal" appears in Able Muse, Summer 2015, along with a ghazal, "With You." The ghazal "Not Literature" appears at the Pleiades website. Eric's translation of Rilke's "Orpheus. Eurydice. Hermes." appears online at Hermes Poetry. Scroll down to read it. A brief essay, "Reading for Otherness," appeared on the North American Review blog November 10, 2014. Eric's review of Diane Radycki's Paula Modersohn-Becker: The First Modern Woman Artist appeared in Open Letters Monthly , September 2013. www.openlettersmonthly.com . An interview with Eric appears on the Columbia Poetry Review blog in connection with publication of his ghazal "Broken" in CPR 26. A short poem, "A Death," appears in The Diagram 12.6. Eric's short essay "In Passing" is online at bioStories. Scroll down to read it. "What Is Your Earliest Memory? What Does It Mean?" appears at the Silver Birch Press website. Full publication information on all of Eric Torgersen's books, with cover images and sample readings, can be found under Books. All poems and translations on this site copyright © Eric Torgersen.